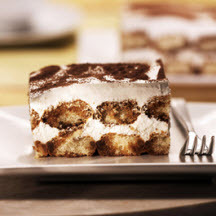 Popularized by the movie "Sleepless In Seattle", this classic Italian dessert has since become an all-American favorite. Easy to assemble, this version requires no cooking. In a shallow dish mix coffee with 2 tablespoons of the vanilla syrup. In a separate bowl, whisk egg yolks and sugar together until pale. Add mascarpone, one large spoonful at a time, mixing gently to keep the mixture light and airy. Add remaining vanilla syrup and mix in gently. Dip about half of the ladyfingers into coffee mixture and use to line the bottom of a 10-inch springform cake pan. Spoon half the mascarpone mixture on top and sprinkle with half of the cocoa powder. Repeat layers, ending with a sprinkling of cocoa powder on top. Refrigerate for at least 2 hours. When ready to serve, release the springform and serve sliced from the metal base. *We suggest using a pasteurized egg product for this recipe. Vanilla syrup can be bought in most specialty coffee shops and many supermarkets. For a more traditional, take on the recipe, substitute dry sherry for the vanilla syrup.